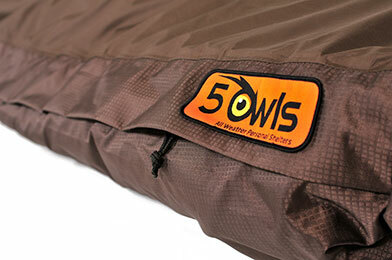 5 Owls All Weather Personal Shelters were developed by passionate technical outdoorsmen. We love opportunities to explore the magic of the outdoors, experience the energy of sleeping on the ground, and see the brilliance of starlit nights. There’s nothing quite like it! What better way to do this than by using any one of our All Weather Personal Shelters. They allow complete unobstructed views of the skies with the ability to quickly and easily deploy either a partial shelter or complete Storm Shelter without ever having to leave the comfort of your sleeping bag. Now that’s convenience! Our innovative designs demand nothing less than the best materials and craftsmanship. Durability, reliability, comfort, ease of use, and attention to details are built-in to everything we make. We encourage you to embark on your own outdoor adventures while experiencing the benefits and joy of using a 5 Owls All Weather Personal Shelter! Owls represent wisdom. In Greek mythology they were often seen as symbols of good fortune and the owl was a protector. Historically in India if an owl hooted five times it was believed to be a predictor of imminent travel. And through this collective history, 5 Owls was born. Through wisdom and experience we hope to bring good fortune to those in the outdoors while protecting them on their journeys both near and far!